In those parts of the modern world that enjoy a high degree of literacy, catechesis has come to rely heavily on written communication to impart the truths of the Faith. Catechumens, and others seeking to deepen their knowledge of the Faith, take ownership of beliefs, morals, and prayers through the written word. However, “Faith … cometh by hearing.” The Word of God, because it is alive, is intended to be conveyed, nurtured, and guarded through living succession: “He that heareth you, heareth Me.” For the first thousand years of Christian catechesis (as well as thousands of years of Hebrew tradition), oral witness was the primary means of passing on the Faith. 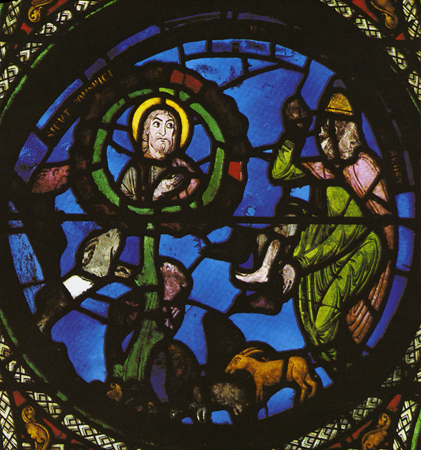 In medieval Europe, a new type of catechesis synthesized oral teaching with visual representations and became the standard for teaching, reinforcing, elucidating, and experiencing the Faith, a pedagogy that, to this day, is still intimately associated with the truths of the Catholic Faith: stained-glass windows. In fact, the widespread destruction of stained-glass windows during the Reformation was directly related to the specifically Catholic subject matter upon which these “lights of Faith” were based. While the beauty of these magnificent windows still engages modern sensibilities, it is hard to imagine how powerfully these artful compositions of brilliantly colored light captured the medieval imagination. The modern world is peppered with visual images of a number and variety unprecedented in history, but the visual palette of people living in the predominately agrarian, illiterate, harsh world of the eleventh century was extremely limited by our standards. Yet, beginning in the late Romanesque and early Gothic periods, the advent of stained-glass windows gave Christians a visual imagery that summarized the truths of the Faith while adding new context and grandeur to their understanding of these truths. In the twelfth century, structural innovations in cathedral architecture allowed for expansion of narrow, vertical Romanesque windows into Gothic walls of colored sunlight that visualized Biblical, theological, hagiographic, moral, and historical narratives of supreme teaching value and gave stunning glory to God—all this while serving as a primary source of catechetical knowledge, inspiration, delight, wonder, and the experience of even deeper spiritual mysteries. Sir Philip Sidney’s defense of the power of poetry to shape men’s minds and hearts applies as well to the power of stained glass windows as a catechetical tool for bringing them to the truths of the Faith. But the windows were not self-evident. In an age of aural learning, these windows were designed to be explained, to be taught: the shorthand of their visual symbols evolved over several centuries into a lexicon of identifiers for those initiated into its complex theological “facts.” The very walls of the cathedral brought to life scenes from the Holy Bible and the Golden Legend, a thirteenth-century compendium of saints’ lives, along with epigrams of moral teaching, episodes from the history of Christendom and the life of the local community, its patrons, and guilds—all enshrined in glorious light—to be taught, cherished, remembered, and passed on. Stained glass, as an art form for decorating windows, is said to have originated in the Orient, with the first European attempts being wrought in Venice in the tenth century. The craft of cloissonné in jewelry making, the plastic arts of classical sculptors displayed on sarcophagi bas reliefs, and the techniques of illustration and decorative embellishment found in illuminated manuscripts are thought to have provided artistic antecedents for the development of the visual imagery in stained-glass windows. Not many examples of early stained glass from the late Romanesque period (when church windows were narrow, deep-set, and rounded at the top) have survived; the oldest extant examples are four of the “Five Prophets” windows in Augsburg Cathedral in Germany, ca. 1100. As techniques developed to displace the weight of the roof to exterior load-bearing supports called flying buttresses, more wall areas could be opened to apertures topped with characteristically Gothic pointed arches. Further refinements in window structure allowed for narrow stone mullions and traceries between individual windows (rather than thick stone walls), providing even more artistic and thematic freedom in combining window groupings with intricate shapes, as well as allowing more visibility from every perspective inside the building. Early stained glass designs involved the use of “pot metal” glass (in which glass color is effected by adding specific metal oxides to the molten glass mixture), which is then formed, cut, and integrated into a framework of lead cames specifically shaped around cut pieces to hold the glass together and form the final picture; further pictorial elements were achieved by etching or rudimentary styles of glass painting. As the craft evolved, new techniques of coloring, such as flashing (laminating clear glass) and painting with glass pigments, both done before the glass was fired, allowed for greater design freedom and detail and eliminated excessive caming. The technical advances in stone construction that opened up the walls to allow for more light allowed the resulting windows to give more complex treatment of theological realities. Complex groups of stained-glass illustrations in huge window areas included such themes as corresponding Biblical typologies from the Old and New Testaments; the Twelve Apostles (and Prophets)—with each Apostle holding a phrase from the Apostles’ Creed; the Jesse Tree of Christ’s ancestry; the life of Christ; the life of the Blessed Mother; the Four Evangelists; stories of saints’ lives; saints of patronage; the Seven Sacraments; the Seven Works of Mercy; the Nine Orders of Angels; and the Last Judgment (sometimes including the Dance of Death). Even the rose-window patterns had catechetical value, with designs using the circle (eternity) and patterns in multiples of twelve, nine, and seven considered theologically significant numbers. 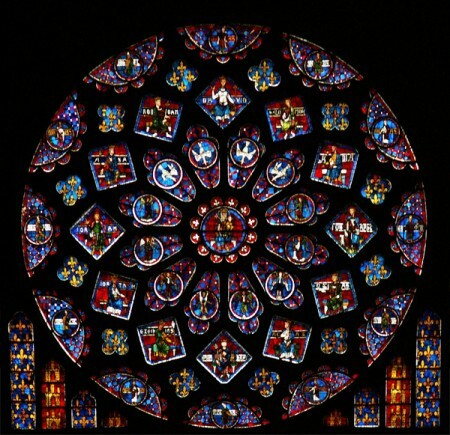 Because it appeared as a sunburst, the rose window was also symbolic of Christ. Not only were these standard thematic treatments, but like so many aspects of the design of the cathedral itself, windows with specific themes were placed in specific locations in the church according to symbolic theological or cosmological beliefs. From earliest Christian times, the priest (ad orientem) and laity faced the direction of the rising sun, awaiting the Second Coming of Christ; for this reason, Catholic churches were always oriented to the East. Thus, Old Testament themes were placed on the north side, since the North was associated with darkness, cold, and evil; conversely, New Testament narratives were placed on the south side. The west side, associated with human history, typically featured the Last Judgment, serving to remind the faithful that they passed from time into eternity when they crossed the cathedral threshold. Within the ordered worldview of medieval Christianity, these hierarchies of spiritual truth, set within the hierarchy of time and space that was the cathedral itself, put everything into an eternal perspective, in a teaching moment that was both organic and inclusive. Within the walls of the church, in the very place where heaven and earth met in divine liturgies and devotional exercises, truth itself was narrated in parables of light. 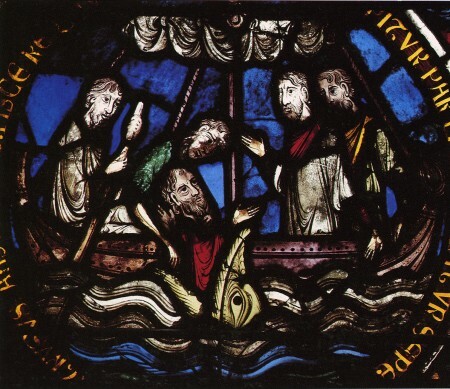 One famous example is the group of windows at Canterbury Cathedral, known as the “Poor Man’s Bible,” of which only three of the original twelve have survived. Such windows were, for most people at that time, the primary visual referents to selected stories and lessons taken from Scripture; yet Louis Gillet has written of the Chartres windows: “Nul prince n’a possédé un livre d’enluminures comparable.” (No prince has owned a book of comparable illuminations.) 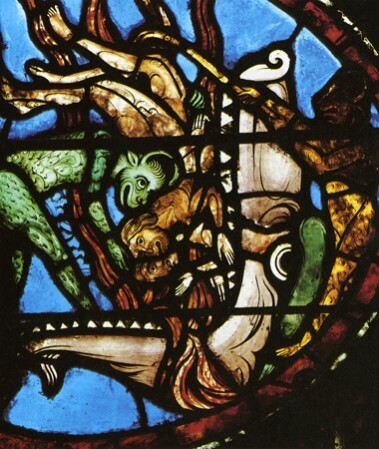 Even the form of their presentation, with ascending pairs of emblems read from left to right, balanced each Old Testament prefigurement next to its New Testament fulfillment, e.g., Jonah emerging from the whale on the left and Christ arising from the tomb on the right. This method of Biblical exegesis can also be found in manuscript treatments, known as “Bibles moralisées,” that depicted type and antitype stories in pairs to highlight the moral lessons implicit in the analogy. Windows narrating a progression of events, such as the life of Christ, the Blessed Mother, or a saint, displayed a series of vignettes based on Scriptural sources, apocryphal texts that supplied anecdotal details (mostly about the life of Mary), and the medieval compendium of the saints’ lives known as The Golden Legend. “The stories are told by gestures and poses. Everything is abbreviated in a highly expressive form of narrative shorthand.” Such windows, whose treatments of subject matter were often transplanted by master craftsmen who traveled, came to define not only factual details but deeper spiritual realities in a shared visual language: “This is symbolism in its deepest sense, communicating concepts by creating understandable metaphors.” Even seemingly decorative details had symbolic and, in this context, catechetical value: “Colours, numbers, letters, geometry, flowers and trees all played a part in the visual textbook of the Faith.” In the artistic economy of stone and wood and glass, every element of cathedral design was valued as an opportunity to display the Faith and reflect the glories of God. Each Sunday, when the priest gave his sermon, he had the power to underscore his verbal teachings with the rich tapestry of visual images that surrounded the congregation. By simply pointing at a window or series of windows, he could reinforce the narrative of the readings for the day, the thrust of his sermon’s moral, or the depth of his religious sentiment —making the windows teaching artifacts that would always remain present to his audience as an aid to memory and a stimulant to reflection. Chartres, one of the few cathedrals that retains most of its pre-Reformation windows, has the inestimable advantage of ensemble, an unbroken, unifying condition establishing a pervasive harmony in the interior and controlling the subdued atmosphere of light and color. In the great vessel of the Cathedral, no extraneous light is allowed to destroy this harmony. In this subdued lighting, an optical phenomenon called the Purkinje shift, or “twilight vision, ” causes “heightened sensitivity to all colours, with maximum receptivity after about half an hour inside the Cathedral.” Abbot Suger of Saint-Denis, who was himself instrumental in the planning and development of early Gothic cathedral interiors, described his sense of being transported “from this inferior to that higher world in an anagogical manner.” Beyond an obvious ability to inspire, this experience of light had still deeper ramifications. Grant that we may so find light that we may set on Thee unblinded eyes; cast Thou there from the heavy clouds of this material world. Shine forth upon us in Thine own true glory … To see Thee clearly is the limit of our aim. The people of the Middle Ages knew that their cathedral-church was … a symbol within their city of the Heavenly Jerusalem … Awestruck, the pilgrim would pass, as it were, through the gates of Paradise into the heavenly city itself, with its walls opened up and set with glittering jewel-like stained-glass windows which diffuse a mystic and divine essence: light. Light, then, formed the “medium and message” for illiterate Christians of the Middle Ages, using narrative and metaphoric imagery to convey the truths of the Faith while steeping the faithful in the spiritually evocative experience of the beauty of God with a mystical atmosphere created by jewel-toned pictures written in light, as well as subtly changing colors in the air and on interior stone walls. The faithful, accustomed to learn aurally, received the message of the Gospel verbally—but with reinforcing visual images created by light, sources of beauty and awe that, it was believed, could mystically connect the eyes of the beholder with the truths depicted, and thus remain lifelong reminders of catechetical knowledge and of the experience of God. Carol Anne Jones holds a Masters in Medieval and Renaissance Literature from the University of Virginia and is currently pursuing a Masters in Systematic Theology at the Notre Dame Graduate School of Christendom College. Her writing credits include articles in Crisis, Catholic Faith, Celebrating Life, and America. She serves as director of religious education at St. Louis Parish in Alexandria, VA.
1. Rom. 10: 17 (Douay-Rheims Version). 3. Lawrence Lee, George Seddon, and Francis Stephens, Stained Glass (New York: Crown Publishers, 1976), 124. 4. The reader is encouraged to consider that illiteracy in those times should not be viewed pejoratively, since it did not necessarily correspond to any deficiency in intelligence or ability to learn or retain concepts. Most people in the working (and often ruling) classes were aural learners, accustomed to being educating through verbal instruction, hearing the hours of their day marked by bells, standing in Church to listen to long sermons and liturgies, and being apprised of news and advertisements by official criers in the marketplace or town square. 5. Sir Philip Sidney, “An Apology for Poetry,” in Critical Theory since Plato, ed. Hazard Adams (New York: Harcourt Brace Jovanonich, 1971), 158. 6. Hendrik Willem van Loon, The Arts: Written and Illustrated (New York: Simon and Schuster, 1939), 205. 7. Sarah, Brown, Stained Glass: An Illustrated History (London: Bracken Books, 1992), 38. 8. Sabrina Mitchell, Medieval Manuscript Painting (New York: Viking Press, 1965), 22. 9. John Harries, Discovering Stained Glass: A Shire Guide; Revised by Carola Hicks (Princes Risborough, UK: Shire Publications, 2001), 32-44. 10. E. R. Chamberlin, “Monastery and Cathedral,” Art and Architecture of Christianity, ed. Gervis Frere Cook (Cleveland, OH: The Press of Case Western Reserve University, 1972), 55. 11. Lee, Stained Glass, 14. 12. Jean Villette, Guide des vitraux de Chartres (Rennes: Ouest-France, 1987), 144. 13. Christopher Hughes, “Typology and Its Uses in the Moralized Bible,” The Mind’s Eye: Art and Theological Argument in the Middle Ages, ed. Jeffrey F. Hamburger and Anne-Marie Bouché (Princeton, NJ: Princeton University Press, 2006). 14. Brown, Stained Glass, 58. 15. de Voragine, Jacobus, The Golden Legend: Readings on the Saints, trans. William Granger Ryan (Princeton, NJ: Princeton University Press, 1993). 16. Janetta Rebold Benton and Robert DiYanni, Arts and Culture: An Introduction to the Humanities, vol. 1 (Upper Saddle River, NJ: Prentice Hall, 1998), 382. 17. Lee, Stained Glass, 32. 19. 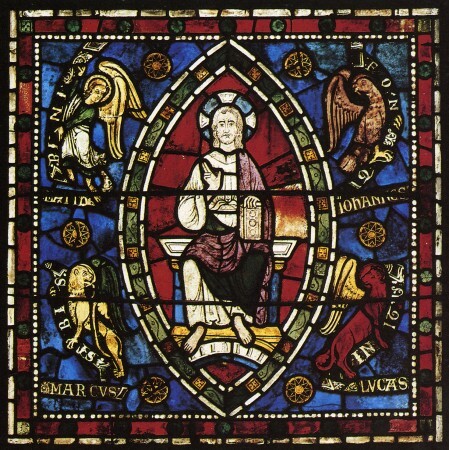 On a tour of Canterbury Cathedral in June 2004, the veteran guide pointed to the oldest surviving stained-glass windows, demonstrating how the priest would use them as teaching tools during his Sunday sermon. 20. William Hone, ed., Ancient Mysteries Described (London, 1823), 193. 21. Benton and DiYanni, Arts and Culture, 371. 22. James Rosser Johnson, The Radiance of Chartres: Studies in the Early Stained Glass of the Cathedral (London: Phaidon Press, 1965), 7. 24. Abbot Suger, Book of Administration, quoted in Johnson, The Radiance of Chartres, 24. 25. Benton and DiYanni, Arts and Culture, 381. 26. Boethius, The Consolation of Philosophy, Electronic Text Center, University of Virginia Library, http://ccat.sas.upenn.edu/jod/boethius/boetrans.html (accessed March 30, 2007). 27. Sears Reynolds Jayne, trans., Marsilio Ficino’s Commentary on Plato’s Symposium: The Text and a Translation (Columbia, MO: University of Missouri, 1944), 140. 28. Benton and DiYanni, Arts and Culture, 381. 29. Chamberlin, “Monastery and Cathedral,” 31. 30. Malcolm Miller, Chartres Cathedral (Andover, UK: Pitkin Guides, 1996), 93. 31. Lawrence Lee et al. Stained Glass, 27.